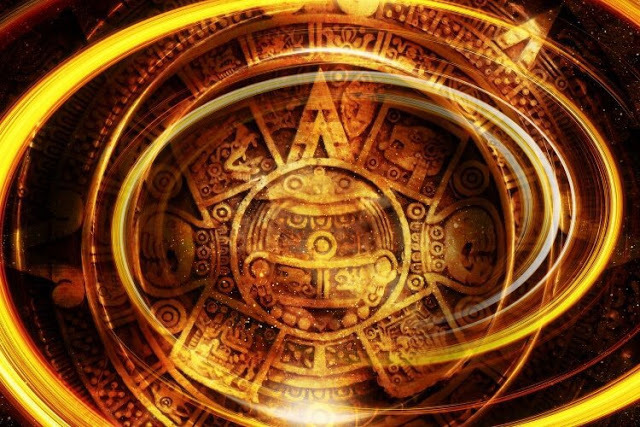 Drunvalo Melchizedek explains to humanity in his last book, The Mayan Ouroboros, how the cosmic cycles come full circle and how this relates to our higher selves. Melchizedek’s book is a continuation of Serpent of Light, and recounts the spiritual guidance our native Mayan ancestors share with us. I have received many questions from people all over the world regarding what is going to happen on January 2016 and the months or years after that. It seems the whole world is asking what is going to happen from the Mayan perspective. Well the Mayans themselves do not know exactly what is going to happen; or when, exactly. We have learned from Drunvalo about a ‘window’ that opened in 2009 and remained open until 2016. Anytime after this period of time, we might have a massive change of energy and vibrations. But the question is not when, why, or what. The question is how we will go through this process. What is the higher self? The higher self is the fragment of God which dwells within humans. It is the absolute and unqualified assurance that humans can find God. Every human who is consciously or unconsciously following the lead of the higher self is living in accordance with the will of God. Consciousness of the higher self is consciousness of God’s presence. Our higher selves are possessed with unlimited ability to communicate with us and they are doing it each moment. They are our spirits, pure spirits; presumably, absolute spirits. They are also pure energy. God is the source of pure energy and pure spirit, so his fragments would be both. Our higher selves are helping us each moment to transform our human nature and temporal, creature selves into the divine nature of an eternal being. Our higher selves are particularly interested not just in our intellectual capacity but more in our spiritual perception. What is the potential of our souls and the spiritual capacity of receptivity. Our higher selves understand our difficult assignments to live here in the third dimension. However, communication with the higher self does not automatically bestow ease of living and freedom from strenuous thinking. Although, such a divine gift could confer a sublime peace of mind and a superb tranquility of spirit. In the coming months and years, when the energy of our Mother Earth will change, we need to connect with our higher selves. We need to go in our hearts and listen. Our higher selves will change our feelings of fear to unconditional love and peace. But they cannot do it mechanically; this is our task. Knowing how to go into the heart and stay there will make the difference when Mother Earth changes vibration to a higher level. When it comes to marking the difference between what is really right or wrong (not merely what you may call right and wrong), you can be sure that your higher self will always participate in a definite and active manner in such experiences. And remember that our higher selves are concerned not just for this life but for our future lives, too. They are interested in helping you here, and to also see you progress to the higher level of consciousness. As you may be a human parent, so your higher self the divine parent of the real you–your advancing self, your better spiritual self. They are the unceasing urge that leads humans to attempt the mastery of the material and present existence in the light of the spiritual and future cosmic cycles. Our higher selves are interested in, and concerned with, our daily doings and the details of our lives, to the extent that these are influential in the determination of our significant, temporal choices and vital spiritual decisions, Hence, higher selves are factors in the solution of our problems related to soul survival and eternal progress. The connection with the higher self is affected by our unsteady and rapidly shifting mental attitudes. The work of the higher self is greatly retarded by our own preconceived opinions, settled ideas, and long-standing prejudices. Because of these handicaps, we may have a slow connection with our higher selves, so confusion of concepts is inevitable. Therefore, safety lies only in prompt recognition of each and every thought and experience for what it actually and fundamentally is, without regard for our fear of what it might have been. The higher self is not devoted to influencing our human thoughts. This is our exclusive personality prerogative. They cannot interfere with our believe patterns. They are dedicated to communicating with us and helping to improve, modify, adjust, and co-ordinate our thinking process. They are devoted to the work of building up spiritual counterparts of our career, of our true advancing selves. Regardless of the year we are in the cosmic cycles or the change in the energy ,we must have faith and remember the difference between faith and belief. Belief fixates, faith liberates. Belief may become group possessions, but faith must be personal. Theological beliefs can be shared with a group, but faith can rise up only in the heart of the individual. Living faith does not foster bigotry, persecution or intolerance. The energy and vigor of faith is according to our knowledge and its striving is the preludes to sublime peace. is full of data scientifically proving that the mind can heal—or harm—the body. But data can be dry, and sometimes what resonates most deeply within our souls are stories. So sit back, grab a cup of tea, and let’s have story time. I’m going to tell you a few true stories that will demonstrate to you how powerfully the mind affects your physiology. As reported by Bruno Klopfer in the Journal of Projective Techniques in 1957, Dr. West was treating Mr. Wright, who had an advanced cancer called lymphosarcoma. All treatments had failed, and time was running out. Mr. Wright’s neck, chest, abdomen, armpits, and groin were filled with tumors the size of oranges, his spleen and liver were enlarged, and his cancer was causing his chest to fill up with two quarts of milky fluid every day, which had to be drained in order for him to breathe. Dr. West didn’t expect him to last a week. Dr. West then injected Mr. Wright with nothing but distilled water. And a seemingly miraculous thing happened—again. The tumors melted away, the fluid in his chest disappeared, and Mr. Wright was feeling great again for another two months. As described by George Engel in the Annals of Internal Medicine, Baltimore Case Study Number 469861 was an African American woman born 22 years earlier on Friday the 13th in the Okefenokee Swamp near the Georgia-Florida border. She was the third of three girls delivered that day by a midwife who proclaimed that all three girls, born on such a fateful day, were hexed. The first, she announced, would die before her 16th birthday. The second would not survive her 21st. And the patient in question was told she would die before her 23rd birthday. describes a case of a psychiatric patient with a split personality. One of her personalities was diabetic, while another was not. Her blood sugars would be normal when she was in her non-diabetic personality, but then when she shifted into her diabetic alter ego, her blood sugars rose, and all medical evidence demonstrated that she was diabetic. When her personality flipped back to the non-diabetic counterpart, her blood sugars normalized. , describes the case of Timmy, who also had multiple personalities. One personality was allergic to orange juice, and when this personality drank orange juice, Timmy would break into blistering hives. However, another personality was able to drink orange juice uneventfully. If the allergic personality was in the midst of an allergy attack and he shifted back to the non-allergic personality, the hives would disappear instantly. Stamatis Moraitis was a Greek war veteran who was living in the United States when he was diagnosed with terminal lung cancer and told he had only 9 months to live. He was offered aggressive treatment, but after 9 doctors apparently assured him that it wouldn’t save his life, he decided to save his money, decline treatment, and move with his wife back to his native Ikaria, a Greek island where he could be buried with his ancestors in a graveyard overlooking the Aegean Sea. He and his wife moved into a small house on a vineyard with his elderly parents, where he reconnected with his faith and started going to his old church. When his friends got wind of the fact that Stamatis was back home, they showed up with bottles of wine, books, and board games to entertain him and keep him company. He planted vegetables in a garden, basked in sunshine, savored the salty air, and relished in his love for his wife. Six months passed, and not only did he not die, he was actually feeling better than ever. He started working in the untended vineyard during the day, making himself useful, and in the evenings, he’d play dominos with friends. He took a lot of naps, rarely looked at a watch, and spent a lot of time outdoors. At one point, 25 years after his diagnosis, Stamatis went back to the United States to ask his doctors what had happened. Apparently, the doctors were all dead. Stamatis finally died this year in Ikaria. He was 102 years old. , Anita Moorjani tells the story of how she was dying of end stage Stage 4 lymphoma when she experienced the classic “white light” near death experience many have described. As she traveled to the other side, she was able to look down upon her loved ones, even though some of them were not in the same room with her. Her heart was filled with a feeling of profound unconditional love, and she was happy to be free of her dying, tumor-riddled body. Then she was told that she had a choice. She could stay in the white light and die, or she could go back and share her story with others. She didn’t want to come back. Her body had been in so much pain, and her soul had been suffering. But she was told that if she came back, her cancer would be cured. She believed what she was told, and felt called to come back so she could share her experience. Anita’s cancer was gone within several weeks. This all happened under the care of her bewildered doctors, who documented her spontaneous remission. Anita is now on the Hay House speaking circuit with me, spreading the message that death is nothing to fear. I will get to hug her this weekend at Hay House’s I Can Do It conference in Pasadena. , a chemotherapy regimen called “EPOCH” was being studied in a research protocol for efficacy. Most of the study centers were reporting consistent results—some benefit from the chemotherapy, but nothing earth-shattering. But one study center was getting dramatically better results, so the research team investigated. What were they doing differently? The patients in one group of the study got Dr. Moseley’s famous surgery. The other group of patients underwent an elaborately crafted sham surgery, during which the patient was sedated, three incisions were made in the same location as those getting the real surgery, and the patient was shown a prerecorded tape of someone else’s surgery on the video monitor. Dr. Moseley even splashed water around to mimic the sound of the lavage procedure. Then he sewed the knee back up without actually doing anything. As expected, one third of the patients getting the real surgery experienced resolution of their knee pain. But what really shocked the researchers was that those getting the sham surgery had the same result! In fact, at one point in the study, those getting the sham surgery were actually having less knee pain than those getting the real surgery, probably because they didn’t undergo the trauma of the surgery. In the past, ligation of the internal mammary artery in the chest was considered standard treatment for angina. The thought was that, if you blocked blood flow through the internal mammary artery in the chest, you’d shunt more blood to the heart and relieve the symptoms people experience when they’re not getting enough coronary blood flow. Surgeons performed this procedure for decades, and almost all of the patients experienced improvement in their symptoms. But were they really responding to the ligation of the internal mammary artery? Or were their bodies responding to the belief that the surgery would be helpful? On a quest to find out the answer, one study compared angina patients who got their internal mammary arteries ligated with patients who underwent a surgical procedure during which an incision was made on the chest wall, but the artery itself was not ligated. What happened? 71% of those subjected to the sham surgery got better, whereas only 67% of those who got the real surgery improved. Researchers in San Diego examined the death records of almost 30,000 Chinese-Americans and compared them to over 400,000 randomly selected white people. What they found was that Chinese-Americans, but not whites, die significantly earlier than normal (by as much as 5 years) if they have a combination of disease and birth year which Chinese astrology and Chinese medicine consider ill-fated. The researchers found that the more strongly the Chinese-Americans attached to traditional Chinese traditions, the earlier they died. When they examined the data, they concluded that the reduction in life expectancy could not be explained by genetic factors, the lifestyle choices or behavior of the patient, the skill of the doctor, or any other variable. Why did the Chinese-Americans die younger? The researchers concluded that they die younger not because they have Chinese genes, but because they have Chinese beliefs. They believe they will die younger because the stars have hexed them. And their negative belief manifests as a shorter life. After 9 heart surgeries, Andy Mackie’s doctors had him on 15 medications, but the side effects made him miserable. So he decided to stop all his medications and spend his remaining days feeling as good as he could. His doctors said he would die within a year, so Andy decided to do something he had always wanted to do. He decided to use the money he would have spent on his heart medicines to buy 300 harmonicas for children, with lessons. And when he didn’t die the next month, he bought a few hundred more. Thirteen years and 20,000 harmonicas later, Andy Mackie finally passed away. or watch my Public Television special Heal Yourself: Mind Over Medicine (watch the trailer and check listings here. Nobody is doomed by their genetic makeup or hard wired to live a specific way for the rest of their lives. YOU mold the clay that is the quantum field, and you do so by aligning your thoughts, feelings and actions (refer to my website for more information on the quantum field, or ‘the field’ for short). In essence, we influence the quantum field through our Being-states (and not only through what we want). A brain region called the frontal lobe plays a key role in envisioning the life you desire. Ask yourself: Who do you I see myself as? How do I show up every day? What would I choose as my predominant Being-state, and how much am I living it on a daily basis? What’s the greatest ideal of myself? Who do I want to be? What would I have to think and feel in order to express that? The clearer you see this, the faster you can change into it. The universal quantum law applies to finances as much as happiness, health and relationships. No exception. If you can hold a vision regardless of what’s going on around you, you are in creative mode, i.e. you refuse to respond to any triggers in your environment, and you KNOW with 100% certainty that your vision must come, as it already happened in the quantum field. This is exactly what we admire in great leaders: Gandhi, Dr. Martin Luther King, Abraham Lincoln, Mother Teresa, etc. Their vision made a difference. They refused to give in to circumstance, did not blame their spouse nor the weather – they did not suffer from ‘excusitis’. Holding a vision is a means to achieving a Being-state which transcends circumstance. Repetition is the mother of all skill – and it is what wires brain cells together to create new neurological pathways. Contrary to the paradigm I grew up in which said that brain cells cannot regenerate nor change, we know today that this is completely false. The brain is highly adaptive (neuroplasticity), and changes occur all the time. The moment you learn something new, your brain makes new connections. A long standing habit can be seen as a broad, very well trodden path, a super-highway where neurons fire when a habitual thought or behaviour triggers them. A new thought or behaviour (i.e. nerve cell circuit) becomes established through use. The more you practice a new thought or behaviour, the better you get at it, just like training a muscle. Paying attention to where you want to go is key. Become aware of how automated (in terms of thoughts, feelings, and actions) your life really is. Keep what you like, and change the rest. Not all automated brain circuits are negative. Some of them are exactly what you want. Others are not. By withdrawing your attention (i.e. quitting to walk the established path) and thinking about how you would rather be (breaking into new territory and establishing a new path), you dissolve those old highways, bit by bit (they disconnect when focus is withdrawn). Self-love is when you respond differently to what you’ve practiced all your life. In order to truly change, we must think greater than we feel. Remember your vision. If you have none for your life, develop one! Now. Not tomorrow… and it’s not about painting some grand picture of your life straight away (but feel free if this feels good to you now). Instead, you can pick out single aspects and start with those. Know what you want, and then assume the corresponding Being-state. This is completely scaleable, i.e. you can expand your vision as you go. But start having one! Having no vision is like going to the airport saying: ‘I want a ticket’, or saying to a waiter: ‘I want food’. You’re going nowhere fast and nothing can come to you if you don’t specify what you would like, and expect it to come. Vagueness equals standstill. In other words, in the context of creating, it’s a no-no, and you must know your target. If you truly can do this (thinking greater than you feel), you have mastered your life. That’s how big this short sentence really is. To envision means to see something into existence. It means to create something with volition and expecting to see it, without having any idea of the ‘how’. That step is up to the field and not your job. Your job is to hold the vision and feel its fulfilment. Your job is to become familiar with the feeling-states of your desires. Mind is what the brain does. Psychologists tell us that c. 95% of our mind is subconscious. Yet it runs us, 24/7, 365. And that’s good! Because if we had to do it all consciously, good luck surviving even a single second, trying to orchestrate our some 50 trillion cells that constitute the body. Not to mention regulating heart beat, digestion, detox, breathing… our innate intelligence takes care of it all and frees us up to create consciously. A marvellous set-up. First step: make them known. Second step: undo them and replace them with what you prefer. Third step: practice the new state. We have many unconscious patterns that we did not choose ourselves, i.e. they arose from our environment (parents, peers, culture, etc) at a young age and were accepted as true. If unchanged, they still operate. That is how people become stuck in repetitive patterns without knowing why. Experiences and events in life produce emotions, which eventually dictate how we behave, unless we intervene. When you think negatively, you feel bad. Feeling bad gives rise to more negative thoughts, which result in feeling worse…do you see the cycle? Most of us are trapped in it, without ever questioning it, living a very reactive life with little room for creating the life we truly desire. Most people do not know how to do this, and that it’s even possible. And it is. Our brain cannot distinguish between something we imagine, and something that is really happening. As far as the brain is concerned, it’s one and the same. So there’s little physiological difference between remembering a negative situation and actively being involved in one. In other words: every time you beat the drum of how bad it is (in response to an observation or a memory), you activate and reinforce those thought and feeling patterns. Eventually, they become automatic, and we forget why we emotionally react as we do – we just react. The perfect stuck state. And it leads to an identity we think is us. But is it? Of course not. A question worth exploring is: What have I memorized emotionally that I live by that I think is me? In this automated state, the body becomes the mind: it knows exactly how to respond to a situation and just does it. A good example is driving a car. When you first learned it, you concentrated a great deal (making new neural pathways). And before too long, you habitually arrive at work, with the car seemingly driving by itself. Your body knows very well what to do. And yes, you take in traffic, etc. and respond accordingly. But it’s all well practiced and smooth, and you don’t think about it. When the body becomes the mind, we live in reactive, unaware mode. This is good for some situations, and not so good for others. The power that you have is one of focus. You can change from a reactive state to a creative one by disconnecting the dots that produce a specific reaction. You do so by focusing on what you prefer instead. When thought becomes the experience, you’re there. When your vision is so compelling and so real you forget everything else, and it feels as if five minutes elapsed instead of three hours, then you’re a creative powerhouse. We all have been in those situations. Whether it’s playing music, reading a great book, participating in an engrossing conversation – time just flew and we could have done it all day. Harness those situations by tagging them with a little intention for your life. The feeling state is perfect – add some directive thought and watch what happens. Mind and body must be aligned, i.e. thoughts and feelings must be congruent to effect real change. To sum it up: what you think and feel today determines how you live tomorrow. Your thoughts and feelings are that important and potent. So why wait learning how to think and feel right? Learn how to dance with your thoughts. It’s fun! I invite you to experiment with influencing the quantum field to your liking. Have FUN! And let me know your outcomes. Dr. Joe Dispenza: Breaking the habit of being yourself – How to lose your mind and create a new one. 2012. Hay House, Inc.
Dr. Joe Dispenza: Evolve your brain – The science of changing your mind. 2007. Health Corporations, Inc. Copyright © 2013 by Larry Dossey. All Right Reserved. Filtering: You take the negative details and magnify them, while filtering out all positive aspects of a situation. A single detail may be picked out, and the whole event becomes colored by this detail. When you pull negative things out of context, isolated from all the good experiences around you, you make them larger and more awful than they really are. Polarized Thinking: The hallmark of this distortion is an insistence on dichotomous choices. Things are black or white, good or bad. You tend to perceive everything at the extremes, with very little room for a middle ground. The greatest danger in polarized thinking is its impact on how you judge yourself. For example-You have to be perfect or you’re a failure. Overgeneralization: You come to a general conclusion based on a single incident or piece of evidence. If something bad happens once, you expect it to happen over and over again. ‘Always’ and ‘never’ are cues that this style of thinking is being utilized. This distortion can lead to a restricted life, as you avoid future failures based on the single incident or event. Mind Reading: Without their saying so, you know what people are feeling and why they act the way they do. In particular, you are able to divine how people are feeling toward you. Mind reading depends on a process called projection. You imagine that people feel the same way you do and react to things the same way you do. Therefore, you don’t watch or listen carefully enough to notice that they are actually different. Mind readers jump to conclusions that are true for them, without checking whether they are true for the other person. Catastrophizing: You expect disaster. You notice or hear about a problem and start “what if’s.” What if that happens to me? What if tragedy strikes? There are no limits to a really fertile catastrophic imagination. An underlying catalyst for this style of thinking is that you do not trust in yourself and your capacity to adapt to change. Personalization: This is the tendency to relate everything around you to yourself. For example, thinking that everything people do or say is some kind of reaction to you. You also compare yourself to others, trying to determine who’s smarter, better looking, etc. The underlying assumption is that your worth is in question. You are therefore continually forced to test your value as a person by measuring yourself against others. If you come out better, you get a moment’s relief. If you come up short, you feel diminished. The basic thinking error is that you interpret each experience, each conversation, each look as a clue to your worth and value. Control Fallacies: There are two ways you can distort your sense of power and control. If you feel externally controlled, you see yourself as helpless, a victim of fate. The fallacy of internal control has you responsible for the pain and happiness of everyone around you. Feeling externally controlled keeps you stuck. You don’t believe you can really affect the basic shape of your life, let alone make any difference in the world. The truth of the matter is that we are constantly making decisions, and that every decision affects our lives. On the other hand, the fallacy of internal control leaves you exhausted as you attempt to fill the needs of everyone around you, and feel responsible in doing so (and guilty when you cannot). Fallacy of Fairness: You feel resentful because you think you know what’s fair, but other people won’t agree with you. Fairness is so conveniently defined, so temptingly self-serving, that each person gets locked into his or her own point of view. It is tempting to make assumptions about how things would change if people were only fair or really valued you. But the other person hardly ever sees it that way, and you end up causing yourself a lot of pain and an ever-growing resentment. Blaming: You hold other people responsible for your pain, or take the other tack and blame yourself for every problem. Blaming often involves making someone else responsible for choices and decisions that are actually our own responsibility. In blame systems, you deny your right (and responsibility) to assert your needs, say no, or go elsewhere for what you want. Shoulds: You have a list of ironclad rules about how you and other people should act. People who break the rules anger you, and you feel guilty if you violate the rules. The rules are right and indisputable and, as a result, you are often in the position of judging and finding fault (in yourself and in others). Cue words indicating the presence of this distortion are should, ought, and must. Emotional Reasoning: You believe that what you feel must be true-automatically. If you feel stupid or boring, then you must be stupid and boring. If you feel guilty, then you must have done something wrong. The problem with emotional reasoning is that our emotions interact and correlate with our thinking process. Therefore, if you have distorted thoughts and beliefs, your emotions will reflect these distortions. Fallacy of Change: You expect that other people will change to suit you if you just pressure or cajole them enough. You need to change people because your hopes for happiness seem to depend entirely on them. The truth is the only person you can really control or have much hope of changing is yourself. The underlying assumption of this thinking style is that your happiness depends on the actions of others. Your happiness actually depends on the thousands of large and small choices you make in your life. Global Labeling: You generalize one or two qualities (in yourself or others) into a negative global judgment. Global labeling ignores all contrary evidence, creating a view of the world that can be stereotyped and one-dimensional. Labeling yourself can have a negative and insidious impact upon your self-esteem; while labeling others can lead to snap-judgments, relationship problems, and prejudice. Being Right: You feel continually on trial to prove that your opinions and actions are correct. Being wrong is unthinkable and you will go to any length to demonstrate your rightness. Having to be ‘right’ often makes you hard of hearing. You aren’t interested in the possible veracity of a differing opinion, only in defending your own. Being right becomes more important than an honest and caring relationship. Heaven’s Reward Fallacy: You expect all your sacrifice and self-denial to pay off, as if there were someone keeping score. You fell bitter when the reward doesn’t come as expected. The problem is that while you are always doing the ‘right thing,’ if your heart really isn’t in it, you are physically and emotionally depleting yourself. Source: Thoughts & Feelings, by Matthew McKay, Martha Davis, & Patrick Fanning. The human mind is a stargate. In fact, it is probably the only real stargate there is. We don’t realize that because from the time we become aware as children, we are told that we live in a tiny box called earth. Within that tiny box the mind inhabits another even tinier box called the human body. From these two boxes, there can be no escape but death, which is not really an escape from the box, but the moment the mind and its personality enters an eternal oblivion. Many people actually believe this and some of them have the audacity to call me a buzzkill. I used to believe what people told me. I believed my brain held my personality and kept it within the confines of my skull. I thought my heart is what kept everything alive. My soul was some nebulous thing that also existed. I just wasn’t sure where it was located. The problem I had, of course, is that throughout my life I had been receiving messages and subtle clues from people that were not like me. These people didn’t seem to always use bodies or to live by the same rules that I did. Some of these clues were unimaginably terrifying, but perhaps only because I was so grounded to the world I was told to believe in, a world whose reality has begun to fall away to some extent. Part of my problem was that I was a a devotee of my own anger and resentment. I used these as far as I could take them as an outlet to work through the dross I had both made through my own actions as well as what I inherited from my family lines. The more I was able to pull down the veil of my inward imperfections and shortcoming, the more the light was beginning to shine through. First as a tiny glimmer and then as a blazing sun. What I witnessed did not terrify me, but for the first time allowed a clean break with the well-ordered world I had belonged to and believed in for so long. The old world was a world of laws and scientific explanations. In that world both meaning and mystique were crowded out by endless explanations that sapped the meaning out of things. Wonder was becoming eroded by unsatisfying ideas, each one new and innovative, yet wholly dead. If we couldn’t see, hear, touch, taste, or smell a thing it didn’t exist. The newly elected priests of the modern world explained everything away with science. The sun, moon, and stars had no significance. They were dead celestial bodies floating in space. Everything had an explanation, and if it didn’t have one somebody somewhere was hard at work on one. The modern world, sadly, has travelled an outward path away from what is real and therefore science becomes increasingly superficial. Instead of giving fulfilling answers, it can only give us explanations that may or may not be true. While the intellect taken to its logical conclusion can deliver a person to the door of the real, it cannot nudge them through it. There comes a point where reason and intellection become a curse that anchors one to the world of death’s reign. If the imagination does not take over, the journey dies utterly. But it is not enough to merely imagine, one must literally exit the unreal by entering the doorway that has always remained open for us. The difficulty of that feat depends on how much we have come to believe in the world we were told to believe in. Ultimately, the depths of the mind must be plumbed to the point of finality, which is really the beginning point of the real world. To open that door to the real world, the reasoning mind must be kept absolutely still, it must put the world as we believe it to death. This doesn’t come with effort, but rather in the absence of effort. It doesn’t come by struggling to create landscapes and characters in the mind. It arrives, strangely, when the mind no longer puts forth any effort whatsoever. In a word, the mind literally surrenders any idea of knowledge upon realizing that the real world doesn’t require wisdom or knowledge, but spontaneity and being. It must simply become what it was before it was forged by the experiences of life, both good and bad. The ”reality” we see everyday is only one part of a much greater world that is unseen, but always present in the eternal now. This world beyond is really the world we live in right now, minus the box we attempt to place it in. Death, no matter how you look at it, removes that box exposing us to the real world. Those that seek to keep that box in place, the box that leads to all pain and suffering, experience the worst of the postmortem states. They attempt to retain the piece because they cannot face the whole truth of what they are. For that reason alone a kind of pseudo-physical world is often entered upon death. I have seen it many times, I have spoken to those living there, and I have seen strange things that could not possibly come from me or the use of my imagination alone. These postmortem worlds run the gamut of ugliness and beauty. The world we have been told to believe in is a lie. This is not a new age platitude or an airy-fairy state of mind I am talking about. This is the unfathomable reality we are not yet ready to face. An apocalypse is on the horizon, and this apocalypse will create a divergent path in humanity. It may be collective, it may be individual. Some will remember and others will continue to forget. That is simply the way things are. The Direct-Intuitive-Nonlocal Mind: Another Foundation for Knowledge? Nonlocal information about the physical universe offers the missing link between objective science and subjective experience, including consciousness and spiritual experiences. Based on the principle of nonlocality and with the “quantum array antenna” of subcellular, cytoskeletal networks, the brain can be resonating with the whole universe. 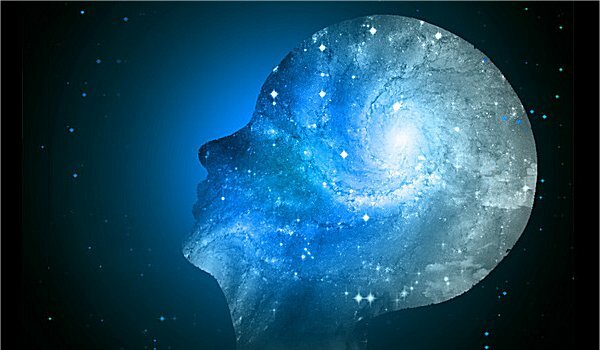 The brain may contain the whole Cosmos like a quantum hologram, and the perennial wisdom of “As above, so below (or: As within, so without)”, “The kingdom of Heaven is within you”, or “Look within, you are the Buddha” creates the appropriate perspective. The cytoskeletal matrix can be the mediator of the Jungian ‘collective unconscious’, and cytoskeletal quantum holography can explain a very common but obscure phenomenon known as ‘intuition’. Ritual ceremonials and other spiritual practices based on the integrative forms of altered states of consciousness (ASCs)—an integrative ASC leads to healing in contrast to a disintegrative one such as psychosis or drunkenness—elude neuroscientific explanations based on classical cognition. Classical cognition can be conceptualized as a ‘perceptual-cognitive’ way of information processing characteristic of ordinary states of consciousness. 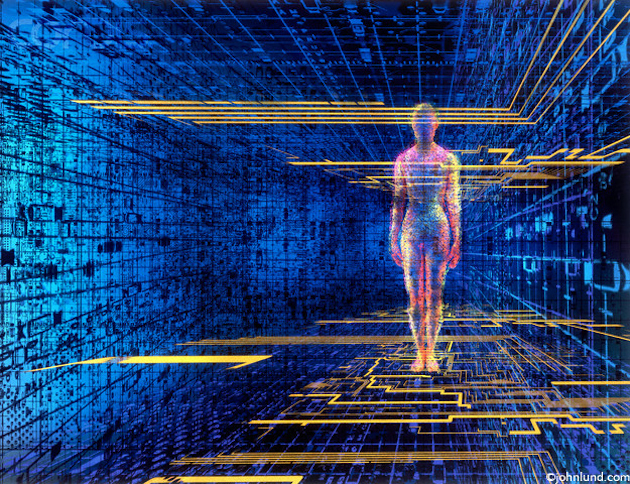 This information processing utilizes the local aspect of the universe and is contrasted with another way of obtaining knowledge, which is based on nonlocal connections denoted here as ‘direct-intuitive’. The ‘perceptual-cognitive’ mode is neuroaxonally based, relies on sensory perception, cognitive processing, and on symbolic (visual, verbal, logical-language) mediation. This form of information processing is an indirect mode of achieving knowledge compared to the ‘direct-intuitive’ way. In accordance with the indirect nature of its processing, this mode splits the world into subject and object, and then performs its modeling. The linguistic feature makes this mode transferable from individual to individual but at the same time limits it to be culturally bound. The ‘perceptual-cognitive’ mode of information processing has been evolved for the purpose of task solving, represents a “coping machine” at work, and reaches its peak in Western scientific thinking. The introduction of a nonlocal, ‘direct-intuitive’ channel is necessary for an ontological interpretation of integrative ASCs, such as the shamanic or mystic states of consciousness. We may assume that this mode of accessing knowledge is based on subcellular, cytoskeletal functions, provides direct experience (no subject-object split), and is not bound by language or other symbols. It is practically ineffable, non-transferable. Since the ‘direct-intuitive’ channel lacks linguistic-symbolic mediation, it has universal characteristics, shows more transcultural similarity, although culture-specific interpretations exist. This may be why mystics get better agreement comparing their “data” than do materialistic scientists. I am not arguing here for the ontological validation of every experience in ASCs, but for a few, very informative experiences that constitute the integrative ASCs. The ‘direct-intuitive’ perception of the world carries a high degree of uncertainty, needs rigorous training for its highest development – as in other fields. It takes decades to train an indigenous shaman or Buddhist monk because the ‘direct-intuitive’ route into the realm of “non-ordinary” consciousness is seemingly capricious, its denizens are unpredictable, and our ‘perceptual-cognitive’ mind is unprepared to face its challenges. What can be nourished can be atrophied as well; the latter happened in Western civilization and the ‘direct-intuitive’ channel has become “The Forgotten Knowledge”. It might have been the source of ancient myths. Giving credit to mythical knowledge also means that the teachings of ancient myths and wisdom traditions should be considered as a starting point for the development of modern scientific theories, and deserve to be treated as “working hypotheses” in applying the scientific method. The ‘perceptual-cognitive’ foundation of knowledge is a result of the brain’s interactions with the local aspects of the universe. The ‘direct-intuitive’ perception of the world derives from the nonlocal features of the Cosmos. In other words: the local universe of the classical, Newtonian worldview is the reality of our ordinary consciousness, based on the ‘perceptual-cognitive’ process. On the other hand, the brain’s interfacing with the nonlocal universe generates the reality of “non-ordinary” states. Moreover, as will be outlined below, the ‘direct-intuitive’ way is also the source of the subjective component of our consciousness. My main point is that intuition, consciousness, and non-locality are interwoven. As a starting point I refer to Ervin Laszlo (2007), who had the notion what I wish to build upon: “What we call ‘matter’ is the aspect we apprehend when we look at a person, a plant, or a molecule from the outside; ‘mind’ is the aspect we obtain when we look at the same thing from the inside.” For me it means that if we use the ‘perceptual-cognitive’—the “outsider” approach—then everything is seen as an object without consciousness. How do we relate to our brain from inside, how do we perceive our own consciousness? Naturally, we cannot see, touch, smell our own or others’ mind. We are left only with the other approach, the nonlocal, ‘direct-intuitive’ mode of knowing, that is the method of looking at things from the inside. The intuitive apprehension is the way for us to recognize that we are conscious. All of us have a direct, intuitive knowledge of our own consciousness, and not a perceptual one. At the base of the yet dominant Newtonian-Cartesian worldview stands Descartes’ Cogito(I think, therefore I am). It presupposes another question: ‘How do I know about myself?’ Turning Descartes’ coin to the other side: “I am aware of myself, therefore (or because) I am intuitive.” That means I have a way of getting knowledge without the senses, without using local processes of nature. This leaves me with the other, the nonlocal mode of apprehension. My conclusion may sound trivial, yet carries non-trivial consequences. ‘Direct-intuitive’ is a way we relate to things from their inside. In the eye of the “insider”—as Ervin Laszlo pointed out eloquently—we always sense the presence of consciousness. Consequently, intuition, nonlocality, and consciousness seem to be intimately related. We can have intuitive knowledge without awareness of its source. However, if we are aware of its origin then we can attribute consciousness to the source in nascendi. In this regard Stuart Hameroff is right: subneural structures (which serve as the interface for the ‘direct-intuitive’ mode of information processing) mediate consciousness. I would add: these structures mediate not only our consciousness, but the consciousness of every entity to which we relate intuitively. What follows next is a generalization: The same way I attribute consciousness to myself, I can attribute it to everything else via the ‘direct-intuitive’ approach, since consciousness arises during the intuitive process. Our perceptual reality consists of material objects, while the world of intuition is filled with conscious entities. Animals, plants, even rocks or the whole universe are conscious. They can be felt to be that in an integrative ASC, which has the ‘direct-intuitive-nonlocal’ approach as its modus operandi. The eternal philosophical debate over the priority of consciousness or matter seems to me to be transcended by the recognition of the reality of nonlocal and local processes. Consciousness and matter are attributes that depend only on the way we obtain our knowledge. Everybody Holds Pain — Where do you hold yours? I recently spent some time with a woman I grew up around. I was in her town and offered to treat her to lunch. I told her to choose a restaurant that she hasn’t been to before and that feels ‘abundant’ and extravagant to her. She chose an all-you-can-eat Chinese buffet. She had a coupon. Her words were hurtful and made my stomach turn. As we finished our meals, my friend stood up and as she did, she gripped her back and moaned. She has had back pain for years and every move she makes is painful. She has been sleeping on the same mattress for 30 years. As I drove back to her home my friend chatted continuously about other drivers and how one ‘should’ always play by the rules so everyone on the road feels safe. When I dropped her off at home and began to say goodbye, her partner of many years greeted me with kindness. My friend’s partner has been depressed for a long time and doesn’t leave the house. Her pain shows as a permanent, downturned mouth and swollen eyes. Perhaps she cries often, I don’t know. We hugged and chatted a bit as I found a place to sit in their living room. It was packed with stuff. Stuff. You know, important things we collect. On the top of one of the piles on the coffee table was a magazine. Reminace. My friend is 80+ and likes to focus upon her ‘good’ life in the 40s and 50s. After chatting about the weather, the government, illegal aliens, and how immigrants ‘should’ learn English in order to stay here in the US, I graciously left and drove back to my hotel room. My 5D sanctuary. We all hold pain. Every body holds pain in it’s own unique way. It can show up as complaining about others, as extra weight (I’ve been there), depression (that too) or physical aches (sometimes). Our individual art or mastery is how we deal with it. How do YOU deal with your pain? Do you even recognize it? One way we cope with our pain is to deny it. ‘If I just ignore it, it will go away.’ But does it truly go away? Or does it simply demonstrate itself in quiet, passive/aggressive ways? As with my friend’s partner-sadness and depression. Another way is to be macho (got testosterone?) ‘I’m as strong as a bull. I can bulldoze my way through anything.’ Yes you can’ until that body or mind gets exhausted and quits in some way-an injury or breakdown. Another way we respond to pain is to project our inner pain onto those around us. ‘Why doesn’t she DO something about that fat/back pain/cough/acne/depression?’ This is a common solution most engage in. If I find others who I can pick on or criticize, I don’t have look at my own pain or where I am off-balance. They are much worse off than I am. I have mine under control. Moan. You can moan and grunt and make big sighs, and perhaps others around you will become sympathetic and pity you. Or perhaps they will ask you what your problem is. This will open the door for you to talk about all your doctors and surgeries and medications. Better yet, find someone you can commiserate with and compare pains. You can make it a game and compete to see who has the sorest back. Self-medicate. Lots of options here. No matter what, it begins in your head. Start with imagining what is possible. Pretend. What would today be if I were not eating a bag of cookies right now? If I were happy? If imagining is too difficult find a living example of the ideal you. What words is that person demonstrating? Certain, Successful, Active, Vibrant? Simply watch how s/he demonstrates that energy. First, decide that the pain and the pickle you are in is no longer fun, nor does it give you the attention/sympathy/comfort it did originally. Then you must decide it is too expensive to carry that rock around in your backpack any longer; it’s too expensive physically, emotionally, and mentally. Then step up to your tool bench and use the tools you have to de-charge that old habit. The Rose, the Grounding Cord, the Living Words and others. (There are many others.) Take baby steps to avoid discouragement or self-pressure. This isn’t a race to wellness. Buying a new mattress and seeing a chiropractor could also be a great first step to relieving that painful back. But if you did that, you might not have much to talk about anymore. You might lose all your complaining friends. You might get happy! An author and teacher, Roxane has been offering tools for developing intuition and Personal Power to individuals, businesses and women’s groups since 1994. Following a successful career as an art director for two large corporations and as manager of her own design firm, she trained as a Life Coach and Mastering Alchemy teacher. Roxane’s seminars include: Spiritual Abilities and Tools for Intuition, Personal Energy Management and Female Alchemy. She also has been featured on television, radio and in national publications both in the US and Australia. She is the co-founder of Mastering Alchemy and presents this work with Jim. PLEASE NOTE: Universal ©Copyright 2010 is authorized here. Please distribute freely as long as the website www.masteringalchemy.comis included as the resource and this information is distributed on a non-commercial no charge basis.